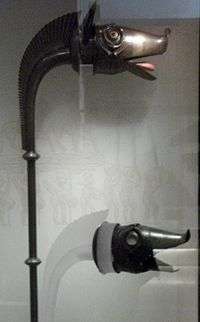 The carnyx was a wind instrument of the Iron Age Celts, used between c. 200 BC and c. AD 200. 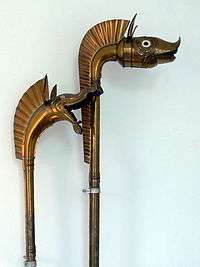 It was a type of bronze trumpet with an elongated S shape, held so that the long straight central portion was vertical and the short mouthpiece end section and the much wider bell were horizontal in opposed directions. The bell was styled in the shape of an open-mouthed boar's, or other animal's, head. It was used in warfare, probably to incite troops to battle and intimidate opponents, as Polybius recounts. The instrument's significant height allowed it to be heard over the heads of the participants in battles or ceremonies. The word “carnyx” is derived from the Gaulish root, "carn-" or "cern-" meaning "antler" or "horn," and the same root of the name of the god, Cernunnos. Until 2004, fragments of only five carnyces had been preserved, from modern Scotland, France, Germany, Romania and Switzerland, but in 2004 archaeologists discovered a first-century-BC deposit at Tintignac in Corrèze, France. In September 2004, over 500 fragments of iron and bronze objects were discovered in a Gallic pit. The objects included a dozen swords and scabbards, iron spearheads, a shield, ten bronze helmets and an iron bird, 2 animal heads, one animal body, a cauldron, and seven Carnyces, one of which is almost complete. These unique military and religious objects are currently being studied by Christophe Maniquet’s team, and are in the process of conservation and restoration by the Materia Viva laboratory in Toulouse. Four of the carnyces had boar's heads, the fifth appears to be a serpent-like monster; they appear to represent a ritual deposit dating to soon after the Roman conquest of Gaul. The Tintignac finds enabled some fragments found in northern Italy decades before to be identified in 2012 as coming from a carnyx. The only example from the British Isles is the Deskford Carnyx, found at the farm of Leitchestown, Deskford, Banffshire, Scotland in 1816. Only the boar's head bell survives, also apparently placed as a ritual deposit. It was donated to Banff Museum, and is now on loan from Aberdeenshire Museums Service to the Museum of Scotland. 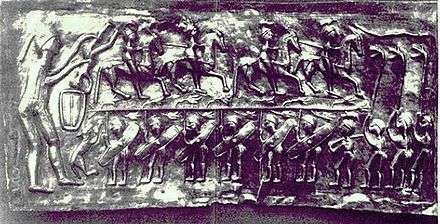 The location and age of the Deskford Carnyx suggests the instrument had a peaceful, ceremonial use and was not only used in warfare. Before 2004 this was the best surviving example, and generally copied in earlier reconstructions. It should be noted, however, that the Deskford find was made almost entirely of brass, a metal used almost exclusively by the Romans, and strictly controlled by them. Further, the basic size and shape of the Deskford find suggests it may in fact have been a Roman military draco standard. The instrument is known from depictions on coins and reliefs, notably from Trajan's Column and the so-called initiation scene of the Gundestrup cauldron. Objects found at Tintignac were exhibited at the 2012 exhibition "Les Gaulois, une expo renversante" (The Gauls, a stunning exhibition). Carnyx of Tintignac, discovered in Corrèze, France. A Carnyx found at Tintignac. Casque in the shape the head of a bird, found at Tintignac. Evocation of a Gallic ceremony in the sanctuary of Tintignac. Recording of a reconstruction of the Deskford carnyx. The reconstruction of the Deskford Carnyx was initiated by Dr. John Purser, and commenced in 1991 funded jointly by the Glenfiddich Living Scotland award and the National Museums of Scotland. In addition to John Purser as musicologist, the team comprised the archaeologist Fraser Hunter, silversmith John Creed, and trombonist John Kenny. After 2,000 years of silence the reconstructed Deskford Carnyx was unveiled at the National Museum of Scotland in April 1993. In 1993 John Kenny became the first person to play the carnyx in 2,000 years, and has since lectured and performed on the instrument internationally, in the concert hall, on radio, television, and film. There are numerous compositions for the carnyx and it is featured on 7 CDs. On March 15, 2003 he performed solo to an audience of 65,000 in the Stade De France, Paris. The carnyx is featured in the opening battle scene of Gladiator "Gladiator" (2000); and is used as both a musical instrument and a fear-inducing weapon. It appears in several battle scenes of the French film, "Druids" (2001). A carnyx appears near the beginning of the 2012 Pixar computer animated movie Brave. Carnyx and co. Carnyx music. Wikimedia Commons has media related to Carnyx.